Watched an advance screening of In Time last night and I saw Happy Feet Two's final theatrical trailer. See the trailer after the jump. In the film, Mumble, The Master of Tap, has a problem because his tiny son, Erik, is choreo-phobic. Reluctant to dance, Erik runs away and encounters The Mighty Sven—a penguin who can fly! Mumble has no hope of competing with this charismatic new role model. Also below are the cool posters and banners featuring the main casts of the animation. Are they so cute? Well except for the Elephant Seals. Directed by George Miller (Award Winning Creator of original Happy Feet), the film features the voices of Elijah Wood, Robin Williams, Hank Azaria, Alecia Moore (P!nk), Brad Pitt, Matt Damon, Sofia Vergara, Common, Hugo Weaving, Magda Szubanski, Anthony LaPaglia, Richard Carter and Benjamin “Lil P-Nut” Flores, Jr. 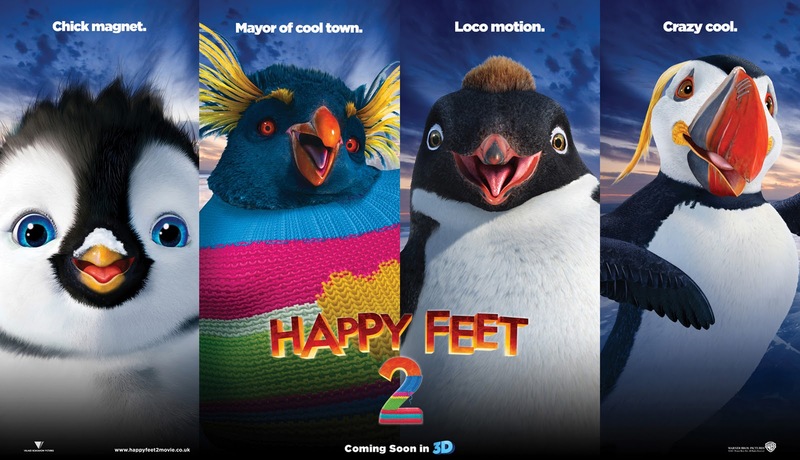 Opening on November 23 across the Philippines in IMAX 3D, 2D and regular theaters, Happy Feet 2 is distributed by Warner Bros. Pictures, a Warner Bros. Entertainment Company.